This entry was posted on September 17, 2012 at 1:27 am and is filed under Bars and restaurants, Chelsea. You can follow any responses to this entry through the RSS 2.0 feed. You can leave a response, or trackback from your own site. It would be fun if the phone numbers were posted on the phone with their original exchange names…. Years ago, in the 1970s, after my friend, Marty Lewis, had his opening night off-Broadway play, “Monopoly” put on somewhere in the 20s, a group of us staggered in to have a celebratory drink to the success of Marty’s first play. Maybe we were too loud or obviously too drunk but they refused to serve us. I still recall the tough locals sitting at the bar and looking us over but after much bitter cursing between us we left. Still I remember that doorway from 40 years ago, looks like nothing has changed. Beautiful! Can’t recall a time when McManus’ generally tolerant barkeep would put Marty out, but that’s not saying it never happened. We celebrated every night of the play as if it was opening night–or closing night–and mostly there. 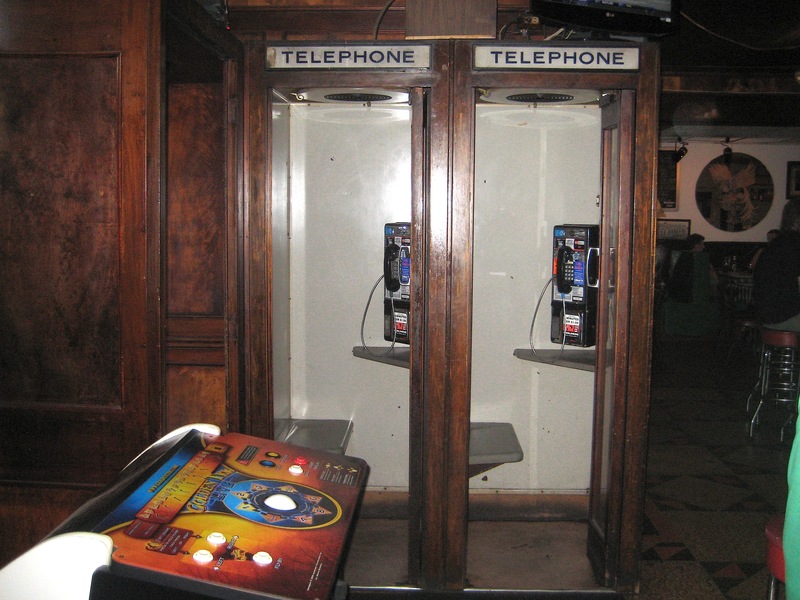 I remember those phone booths, and the magnificent old bar, with its vintage wood and mirrors. 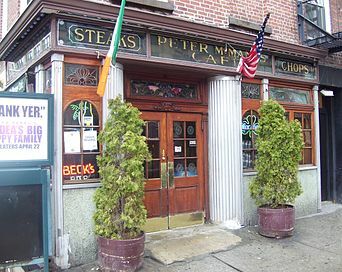 The tavern was often used as a movie location. The sight of white paper over the font windows, and umbrella-shaded lamps on the sidewalk outside was almost as common as the mix of “regulars”–including old neighborhood guys, yuppies, and young singles. I do take exception to the headline on this page, however. I would never describe McManus as a “dive” bar. If anything, it maintained a constancy and dignity that has helped it withstand decades of trendy bars that come and go like spilt beer. You know, I think you’re right, it’s not a dive. I took the word out of the headline. I was trying to find a short word to describe the laid-back, unpretentious vibe. Thanks. As for a single word, how about “authentic?” That would sum up everything from the never-changing decor to the comfortable neighborhood atmosphere. it’s the right word…but too long for the headline! ARGH! That was supposed to be “connotations”. I’m not sure much of anyplace constitutes a “dive” anymore. People started using the term to describe a bar that didn’t have votive candles on the coffee tables in front of the couches. I recall some truly dank places where a mixed drink was an iffy proposition because of the quality of the booze and the cleanliness of the glassware. (Best to order a bottled beer – and pay attention for a noticeable “pffft” when it was opened.) They’re gone, as far as I can tell. I’m with Rocco: What often gets labeled “dive” is what I think of as a perfectly normal place.